Lady Eve Millinery, owned by Milliner, Aimee Koch specializes in vintage inspired hats and headpieces. Each unique piece is blocked by hand using vintage techniques to recreate the exquisite styles from the past. See a behind-the-scenes peek from Aimee's millinery shop and see what's inspiring her on Pinterest. Today, Aimee is giving away one of her amazing hats of the winner's choice to one lucky girl. for up to 5 additional entries, follow the punch tab widget below! I would love to win any of these! I've wanted one of her hats for so long! What a lovely Mother's day surprise that would be! Gorgeous, gorgeous hats! Each one makes me want to sew up a matching outfit to coordinate! lovely hats! good luck everyone! I adore vintage (or vintage-style) hats!! Such beautiful hats. I'm sure whoever wins will look smashing in one. I would love to take one of those hats out strolling in the streets of Odense, Denmark! Her work is beautiful! I would love to have one of her hats! Beautiful hats! She does gorgeous work. Gorgeous hats! There's such a lot of choice. Such lovely handicraft. I'd love one of those hats! Oh my gosh! What gorgeous hats! I'd love to have one. Thanks for hosting this giveaway. What a wonderful giveaway! Gorgeous hats! Thanks for including us in the fun! These are gorgeous! Especially love the little black one. I'm hopelessly, deeply, darkly smitten with Lady Eve's cocktail hat. It would be a dream to wear at a dear friend's wedding in the English countryside this summer! Do check back to the shop mid week. I have a number of *new* styles I will be listing including 2 darling 1940's halo/bonnet brimmed hats. I've just come into some real vintage block treasures!!! What a generous giveaway! Her hats are totally amazing! I'd love something pretty and practical to keep the sun out of my eyes or hide a bad hair day! I love hats but rarely get to find ones that fit due to a big head size, and thick hair and the newer styles just not looking right. As a pale redhead, I need to not be in the sun, so a hat is a good thing for me. Oh wow. I love this giveaway! Thanks! O my word, these hats are gorgeous! I love the simple, clean, vintage lines. So crisp and beautiful! LOVE. Very exciting! These hats are truly amazing. I've been admiring Aimee's artistry for almost a year now and I would love to win one her hats. Her inspiration, vision and talent is just incomparable. Like a step back in time! Omg.... my sister's birthday is coming up and I could see her looking fabulous in every single one of these hats. Great giveaway! <3 Jackie @ Let's Go Thrifting! These hats are so pretty! Especially the purple one. While I don't think wearing hats never goes out of style (all the lovely ladies online love them) I think what people are wearing isn't really fashionable. If I could go out in the purple hat above I would feel like a million bucks. I propose we start a permanent trend that beautiful hats for ladies and men should come back. Who's with me! I love that green hat in the collage; it would go perfectly with a blouse I just made! Her hats!!! Holy smokes! Oh how beautiful they are! I love the 1920's Ivory Cloche! It's so lovely and would match so many things! Good luck to everyone and thank you so much for the giveaway! I love the hats, so beautiful! These aren't merely hats, but true works of art! I would kill or die for a hat as lovely as any of these! But my favorite has to be the black one with the saucy sash. Fingers crossed forever! Oo LaLa....Cocktail Hat Black Fur Felt Velour with Velvet Bow and Feathers "Eve"....the perfect addition to finish off my Melbourne cup outfit! Fantastic hats! They remind me of Marie Mercie in Paris. I'll take the straw one with ribbons "when" I win. Beautiful hats! Thanks for the giveaway. I am so thrilled to find another plus sized vintage loving gal! I am so going to keep tabs on you! I have always admired these beautiful hats! an inspiring milliner! I love vintage hats! they can really complete a vintage outfit. Your hats are so beautiful! Thank you for such a great give away! Some beautiful hats in her shop. I really need more hats in my life - I barely own any! Some great hats! I'm super into 30s/40s tilt fedoras these days, though that straw tilt is perfect! Wow. These are amazing hats. I'm partial to the leopard one but the purple "Irene hat is lovely. GAH! This is maybe the best giveaway ever! :D Awesome! I've always wanted a hat just like her wide brimmed "Hazel" hat. It looks so good with fluffy long-haired pin curls. I would love one of those pillbox hats! Does she make great hats! Love her hats - especially the tilt styles. Thank you for this great giveaway! Wha....!?! I need the black one (bottom right) so badly! How lovely! My fav is the brown one at the top but they are all just darling! 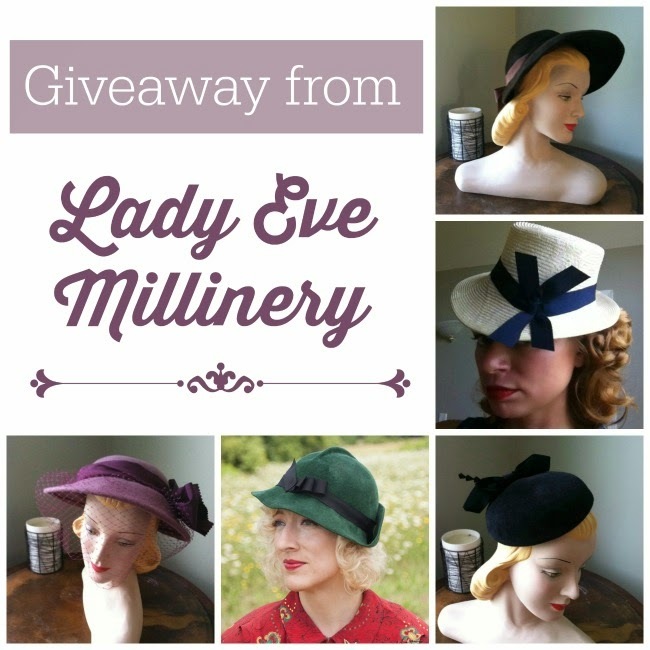 I would LOVE to be lucky enough to win this one--what amazing hats! The Zelda cloche is my favorite! I am a vintage loving girl, with alopecia, so instead of doing my hair, I play with hats! I would love to have one of these! I absolutely adore Lady Eve's creations. I have a lot of difficulty finding hats that suit me so getting one from her that I can choose would be wonderful. Oh, amazing. Even though we're heading into summer, the 1940s halo styled hats look just divine. One can never have too many hats! Lady Eve certainly has style and talent. Her hats are dreamy! Delightful! I would wear my Lady Eve proudly! Wonderful hats! I always enjoy her Pinterest boards. Just seeing these makes me smile! Very lovely, I especially like the purple one in the picture above. Alona Y for entry. Her work is astounding! I would love to win the purple or black hat in the picture. Oh I've always wanted a pretty hat like these!!! So pretty! What a great giveaway! I am such a hat person, and these are divine! !